ROCKINGHAM – The Accreditation Committee of the College of American Pathologists (CAP) has awarded accreditation to FirstHealth Moore Regional Hospital – Richmond (MRH – Richmond) based on results of a recent on-site inspection as part of the CAP’s Accreditation Programs. MRH-Richmond’s Laboratory Medical Director, Henry G. Marrow, M.D., was advised of this national recognition and congratulated for the excellence of the services being provided. During the CAP accreditation process, which is designed to ensure the highest standard of care for all laboratory patients, inspectors examine the laboratory’s records and quality control of procedures for the preceding two years. CAP inspectors also examine laboratory staff qualifications, equipment, facilities, safety program and record, and overall management. MRH - Richmond is one of more than 8,000 CAP-accredited facilities worldwide. In addition to FirstHealth Moore Regional Hospital – Richmond’s accreditation, the labs at Moore Regional Hospital (Pinehurst), Moore Regional Hospital – Hoke (Raeford), Montgomery Memorial Hospital (Troy) and FirstHealth Sanford Hematology/Oncology (Sanford) also received the CAP accreditation. The Accreditation Committee of the College of American Pathologists (CAP) has awarded accreditation to FirstHealth Moore Regional Hospital – Richmond (MRH – Richmond) based on results of a recent on-site inspection as part of the CAP’s Accreditation Programs. 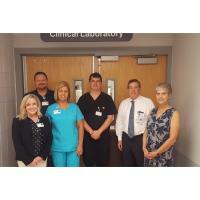 Pictured above from left to right are: Elise Forest, administrative director of FirstHealth laboratories; Mitch Staub, cardiopulmonary manager, MRH – Richmond; Lori Phagan, laboratory director, MRH – Richmond; Barry Rimer, assistant lab director, MRH – Richmond; John Jackson, president of FirstHealth’s Southern Region; and Betty Lynn Warnock, retired laboratory director, MRH – Richmond.